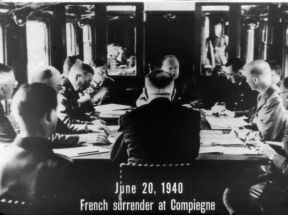 The end of the battle for France comes with the signing of an armistice in the historic railway car in which Marshall Foch dictated terms to the Germans at the end of the first World War. 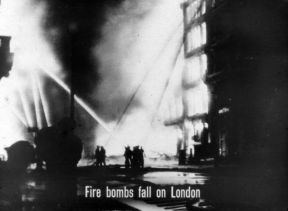 In December, one single night of fire bombs jailing indiscrintinately over London destroy vast areas and many historic buildings in the citya disaster almost measuring up to the great tire of 1666. August 14, 1941. As Germany overruns all of Europe. 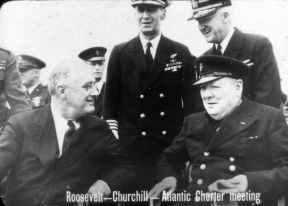 President Roosevelt and Prime Minister Churchill in conference aboard an American cruiser in Newfoundland waters draw up a charter of common principles in national policies. An organization of toughened. 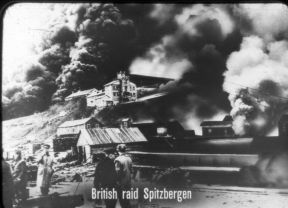 specially trained fighters known as Commandos is created by the British to launch sudden violent attacks on German coastal garrisons all the way from France to Spitzbergen. They spread terror among the Nazis. burning oil dumps and destroying communications. On Sunday morning. 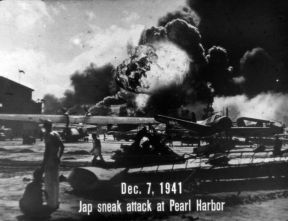 December 7, 1941, a strong task force of the Japanese Navy launches without warning swarms of carrier-based bombers against the American naval base and fleet at Pearl Harbor, destroying hangars and planes in the first attacks. In subsequent attacks, many casualties are suffered and half the battleships of the United States Navy are either sunk or severely damaged. On December 8. 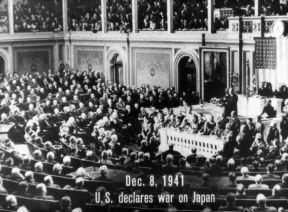 1941 the congress of the United States declares war on Japan. when President Roosevelt solemnly announces that a state of war has existed since the infamous attack. Three days later Hitler and Mussolini. 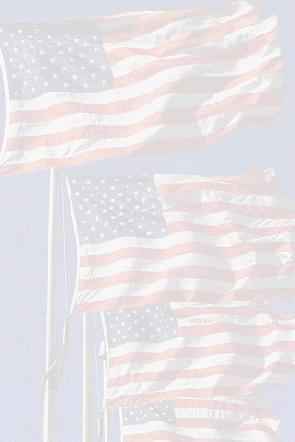 believing American naval power wiped out, and fulfilling a pact with Japan. declare war on the United States.